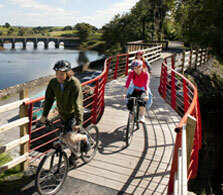 Showcasing the hidden gems that CycleWest Ireland incorporate into our bike tour itineraries and beyond! 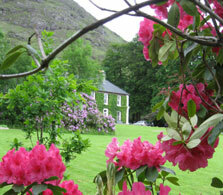 Choose to extend your trip and we can recommend some hideaways and activities to enhance your Ireland trip. Rediscover romance in a castle getaway or make time to make new family memories by the sea. Explore the caves and cliffs, surf the waves or ride a horse along the beach. 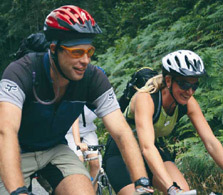 Our Western coastline is here for you to explore and we are there every step (or pedal) of the way! Here are just a sample of what you can enjoy along the way….. 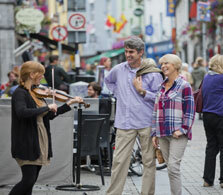 Whether your desire is to spin through the magnificence of Connemara, travel off the beaten tracks of Western Shores, explore the ancient forts of the Aran Islands and the Burren, CycleWest Ireland guarantees youauthentic and creative itineraries for all levels and abilities. Self led, family, guided and private groups catered for. 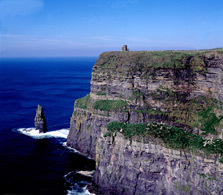 The magnificent Cliffs of Moher top the list of places to see and things to do on any trip to Ireland. A unique experience is always guaranteed, including stunning views of the dramatic Atlantic coastline across to the Aran Islands and Loop Head along 600m of pathways. 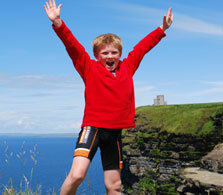 We offer itineraries especially designed with children in mind. Our selection of child friendly hotels and lodges offer family suites and activities. Our programmes for children include hill walking; fishing; surfing; kayaking; biking; cookery classes; organic farm visits and island safaris. Join us for a never to forget family travel experience! 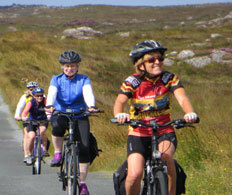 CycleWest Ireland's guided bike tours in Ireland, bring you to some of the most unspoilt landscapes and immerse you into the culture, the history and culianry delights of the regions to which we visit, your experience enhanced with expert, local guides. We believe that our trips should be an opportunity to meet people and make new friends. With us, you can enjoy the benefits of group travel without the hectic pace of a larger group tours. 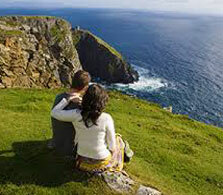 Whether you are planning a luxury romantic retreat in a majestic castle or quaint cottage, an adventure honeymoon touring throughout the traditional wonders of Ireland or an activity honeymoon, Ireland has all that you would wish for. Our Private Escapes enable us to create a journey that is exclusively yours. Celebrating an anniversary or special occasion? Planning a honeymoon? If you wish to celebrate in style and have a little exclusivity, the CycleWest Ireland team have created a portfolio of destinations that will ignite your senses. Our escapes are designed to immerse our clients into a world of culture, wildlife and hidden gems. We aim to deliver a memorable experience tailored to your needs. 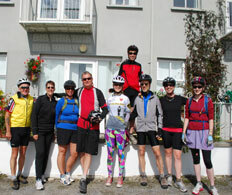 CycleWest Ireland’s self guided, luggage free bike tours take you to some of Europe’s best and most unexplored countryside. Carefully designed to suit your travel needs and dates, we take care of all of your details so you are free to immerse yourself in the culture and scenery in which you are travelling. Pedal at your own pace, luggage free and discover the beautiful sights, sample the local fare, take time to walk on a sandy beach and stop to digest the breathtaking landscapes. Our small group sizes and professional, yet informal and contemporary style makes our trips a welcoming, personal and safe way to see the off-the-beaten-track side of Ireland, to learn all about its history and culture, its myths and legends, to take part in some refreshing activities and to enjoy great Irish scenery, welcome, music and pub life. Come join us!